I hate to waste paint so, if I find I have some paint left over from a project, I smear it into a page in my art journal where it stays as a potential first layer for some future creating. One such page of leftovers was the basis for this week’s art journal page. It was created in response to the Art Journal Adventure prompt for this week: the letter O. I like vague prompts because they give me the nudge to create while giving me the scope to really do whatever I want. You may have noticed that I like to illustrate skeletons. They are never anatomically correct and I cannot really put my finger on why I am so drawn to them as a subject but I just go with it. Do what you enjoy, right? I, therefore, ended up illustrating the skeleton of an ouroboros. The O had made me think of circles and hoops and infinity and that made me think of ouroboros, which handily begins with the letter O, and it instantly became a skeleton in my mind’s eye. 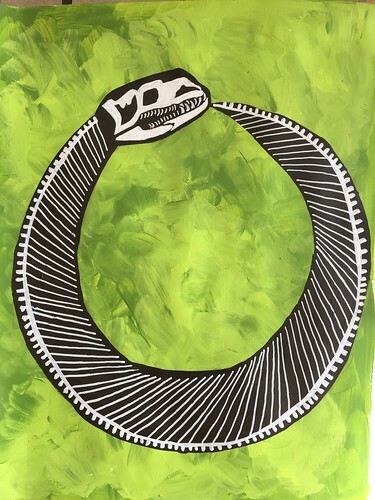 An ouroboros – just in case you didn’t know – is a serpent consuming its own tale, an image found in many mythologies, symbolising eternity through the endless cycle of life and death. This week’s Art Journal Adventure prompt was to take inspiration from mythology, folk stories, and fairy tales. If you are thinking to yourself that the prompt seems right up my street that is because it is. Precisely so in fact. That is because I was asked by Bonnie and Barbara to be a guest artist this week. I was flattered and honoured to do so and, of course, that meant it was up to me to choose the prompt. You can find my post on the Joggles blog he﻿re and that outlines my process, illustrated with photos, in creating this art journal page. I chose a selkie as the subject of my art journal page. Selkies are creatures from my country’s mythology (and that of Ireland) and I grew up hearing tales of seals that could transform into people, of stolen seal skins, and wives who fled back to the sea. 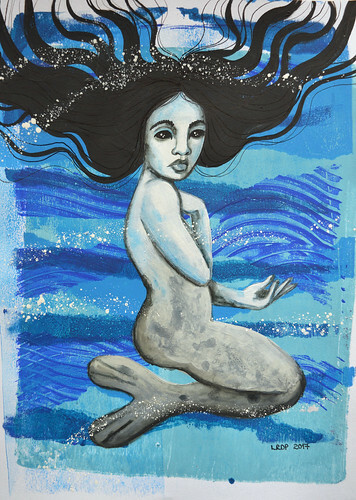 I draw them quite often and have featured art work inspired by them twice on my blogs: once as a mixed media painting of a selkie in seal form and once in my altered book of monsters. I think this is my favourite of the mixed media selkies I have painted so far. The last of my Mixed Media Mythology lessons was taken by Sarah Leonard. The subject of this final lesson was Vesta, the Roman goddess of the hearth and home. Because Mr Pict is a complete and utter nerd about ancient Rome, I was very familiar with Vesta (and her Greek counterpart Hestia). Vesta was both the oldest and the youngest of the major gods in that she was the first born child of Kronos and Rhea but the last to be released from her father’s stomach when Jupiter killed Kronos and freed his siblings. She chose to remain a virgin (hence Vestal Virgins) and she took care of Jupiter’s house for him, which leads to her association with domesticity. The thing I particularly appreciated about Leonard’s lesson was that it was about translating concepts, ideas, connections into a visual medium. I liked the flexibility and freedom that afforded. Therefore, as happened with my response to Leonard’s lesson on Freya, my art work massively diverged from the exemplar. My painting is mainly watercolour with some ink and I worked in shades of brown to reflect my home, which is mainly neutral, natural colours. I painted the “hearth” bowl copper (acrylic) because my living room has a large copper trough beneath the window. The flames are collaged scraps of gelli print and the embers of red and gold are spatters of acrylic. I focused on Vesta’s connection to the hearth because for me a fireplace has become an important element of a house feeling like home. We had our last home, in Scotland, built for us and as such I designed the fireplace. It was more of an emotional wrench for me to leave that fireplace behind than it was to leave the rest of the house. One of the reasons why our current house particularly appealed to me was that it had a fireplace I could envision us sitting around in winter. My painting of Vesta, therefore, does stick to the lesson brief in being about domesticity. 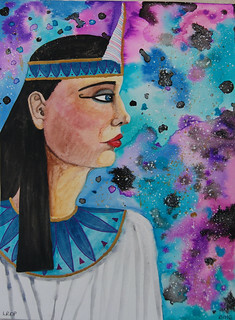 My penultimate lesson for Mixed Media Mythology was a depiction of the Egyptian goddess Maat. Maat represented justice, truth, balance and morality. She brought order to the heavens and was often symbolised by a feather. Lezette Markham was the tutor for this lesson and her demonstration was of a much more symbolic, representational art work. However, since I have produced figures in all of my work in this series, I decided I wanted to actually have a crack at painting Maat herself while incorporating ideas from Markham’s tutorial. And that was where I went wrong. I often feel like I have to take two steps backwards in order to make one step of forward progress with my art. This piece was one such step backwards. The profile went badly wrong, her head becoming smooshed in its proportions. It reminded me of the way in which I went wrong with the profile of Zebra Woman in my Altered Book of Monsters. Note to self: must practice profiles more often. I do like the puddly, mixing, liquidy background – one of the elements I took from the tutorial – but otherwise this piece is consigned to my “I learn from my mistakes” pile. The next lesson I undertook in Mixed Media Mythology was taken by Jeanette Montero. 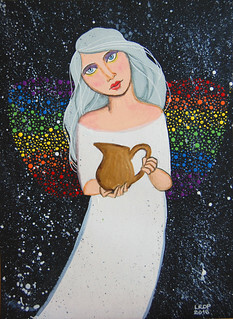 The subject was Iris, goddess of the rainbow and messenger of Zeus. As ever, I drifted quite far from the exemplar, taking ideas from the lesson and making them my own. This time the elements I took from the tutorial were colourful spatter on a black background and incorporating the oenochoe jug. I wanted to give my figure’s body a gentle curve to echo the curve of a rainbow. I also had the idea of letting her lower body fade out rather like the ends of a rainbow fade out. I am not convinced that latter decision has worked well in the composition, however. I like the spectrum dots behind the figure but am not wholly convinced that they read as wings. 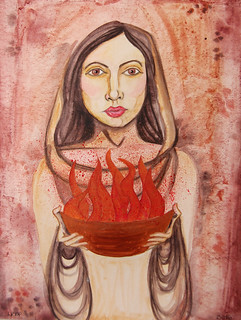 I won my place on the Mixed Media Mythology course through Julia Osterc and her Loving Road blog. It was her lesson on Gaia that I tackled next. In Greek Mythology, Gaia was one of the first gods, was the creator of Earth, and Mother of the gods and Titans among others. Osterc’s approach to depicting Gaia was very intuitive, fluid, and organic. That is not an approach that ever particularly rewards me. I, therefore, took a different approach to constructing the painting. I did, however, borrow three particular ideas from Osterc’s exemplar: the idea of Gaia as maternal or even grandmotherly, incorporating maps, and using collage elements as finishing details. 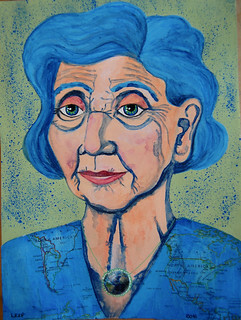 I have not drawn an elderly person for over two years so I really liked the idea of tackling the face of an older woman. That then became the focus of my painting, getting that right. I clearly need some practice in this area but overall I am satisfied with what emerged. I think she looks like a kindly granny. I used a map from an old atlas as the clothing for Gaia, and I used an image of the globe from a postage stamp to become a pendant, forging that connection between her and Earth. I used shades of green and blue for the same reason. The next lesson I tackled in the Mixed Media Mythology course was another by Lucy Brydon. This time the subject was Halcyone (or Alcyone) whose tale in Greek Mythology is one of hubris, punishment, loss, grief, and metamorphosis. It is from her that the phrase “Halcyon Days” derives and she is also associated with kingfishers. The lesson involved creating a splodgy, inky background. I really enjoyed creating it though it possibly ended up being a bit too vivid and bold in comparison to the figure. 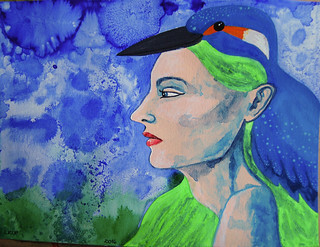 As the instruction was to draw a female profile and incorporate a kingfisher, my mind flitted to the Phoenix Woman painting I produced a short while ago and I decided to go with a similar composition. I also borrowed from it the idea of making the kingfisher a type of headdress rather than attempting to paint a separate bird. It helped me avoid having to paint a realistic bird but I also thought it might work thematically in terms of Halcyone’s transformation.